Crater Lake National Parks deep blue water and searing caldera walls have long attracted the wonder and admiration of people. The deepest lake in the United States, with a depth of 1,943 feet, Crater Lake is also one of the cleanest and clearest bodies of water in the world. Largely pristine old growth forests surround the lake and support a diversity of Cascades plant and wildlife. In 2016, the National Park Service celebrated its 100th birthday and reaffirmed its commitment to protecting this nation’s natural and cultural heritage. The national park system totals 410 sites including national parks, monuments, battlefields, historic sites, sea shores, national trails, and more. President Theodore Roosevelt declared it a national park on May 22, 1902, the fifth oldest national park. Crater Lake, at the northern end of the Volcanic Legacy Scenic Byway – All American Road was formed when Mount Mazama imploded, leaving a huge hole called a caldera which eventually filled with water to create the lake. With a depth of 1943′, it’s north America’s deepest and clearest lake – the intense blue will astound you! Visibility at times can be 140 feet! Known only to local Native Americans who revered it, the lake was originally named “Deep Blue Lake”. 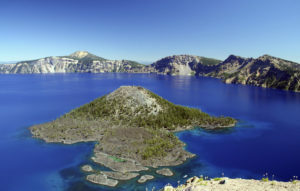 In June 1853, prospectors hunting for gold led by John Wesley Hillman stumbled upon Crater Lake. President Theodore Roosevelt declared it a national park May 22, 1902, making it the fifth oldest national park. Read more about the history of Crater Lake National Park here. During summer navigate the 33-mile Rim Drive around the lake, enjoy boat tours to Wizard Island, camp at Mazama Village, or hike the park’s various trails, including Mt. Scott which peaks at 8,929 ft. Swim the cool, clear water at Cleetwood Cove. Boat tours typically begin June 30th and end September 16th (weather permitting). It’s a steep mile-long downhill walk from Cleetwood Cove parking area to the lake for boarding the tour boat. The nearly two-hour ride includes interpretive talks and stops at Wizard Island. Go early in the day and spend a couple hours on Wizard Island hiking and fishing! While this tour is not available during Ride the Rim, you can inquire to see if it is operation the day before or after by calling 866.292.6720. Learn more! Over 90 miles of hiking trails and 33 miles of the Pacific Crest Trail offer endless hiking opportunities. You might decide to climb Mt. Scott – the view from the top is unsurpassed. Learn more! Overnight camping available with a permit. Learn more! Crater Lake offers cabins for those that prefer to stay neslted in the Ponderosa pines. These rustic cabins provide warmth and comfort after a long day gazing at the lake or hiking on the trails. Learn more! No fishing license required! Use artificial lures and flies to land Kokanee and Rainbow Trout. Fish all year (weather permitting). Access is via Cleetwood Cove Trail. Learn more! Ride the Rim! This very popular event takes place in August each year. Event participants register for either the Century Ride (100 miles), or the Metric Century Ride (62 miles). Century riders will climb more than 7,000 ft. while enjoying the breathtaking views from Rim Drive around the Crater Lake Caldera. The 33 mile Rim is one of the most popular and spectacular rides, whether biking or driving – the road is narrow with long steep grades so prepare ahead of time! Another popular set of annual events, in August, are the Crater Lake Rim Runs and Marathon. There are three courses to choose from including a Marathon and a run/walk. They are: a 6.7 mile (run or run/walk), 13.0 miles and a full Marathon (26.2 miles) course. All courses are along the rim and are at altitudes ranging from 5,980 ft to 7,850 ft above sea level. Be challenged by rugged mountains and breathtaking views! For more information visit the Crater Lake Rim Runs website. Another event to watch for is the annual “Car-Free” weekend, when portions of the Rim Drive are closed to motor vehicle traffic. This is a great way to see the park by bike or by foot – without auto traffic. Learn about the “Jewel of the Cascades” and other natural and historical stories about Crater Lake in these 20 minute talks presented by park staff. Junior Ranger Programs are available for the kids, too! Stop by the video viewing room in the Steel Center to watch the new Crater Lake film. It’s about 20 minutes and provides high tech insights and explanations into the formation of the park. This is a must-see video as it’s very well done. Three historically designed trolleys operate at Crater Lake National Park, touring up to 25 passengers each on a two hour tour around the Rim Drive of the lake with several stops at specific areas of interest. The tour includes a National Park interpreter/guide that provides information about the unique features of Oregon’s only National Park. Click here for a touring schedule, once the Rim Drive is open each year. Tickets can be purchased at the ticket booth located by the Community House at Rim Village or reserve here. Open daily, 10:00 am – 5 pm late May to late September (7:00 am – 9:00 pm in July & August). Closed October to May. Gasoline available mid May to mid October. Open from early-June through mid-September is located in Mazama Village, seven miles from the rim of Crater Lake. Seating is available for 100 guests. The restaurant features a melting pot of American cuisine with breakfast, lunch, dinner, and soup and salad buffets. Beer and wine is also available. Crater Lake’s premier fine dining establishment. Features Northwest cuisine made with choice Oregon-grown ingredients. Sample the best of what Oregon has to offer, from the freshest, locally-grown mushrooms and berries to Rogue Valley cheeses and wines. The Dining Room is open for breakfast, lunch, and dinner with seating available for 75. You may also contact reservations at 866.292.6720 for any further questions. Features “Grab and Go” items including hot soups, sandwiches, salads and snacks. This 1,500-square-foot café has a seating capacity of 36 inside and 48 on the adjoining patio. The 2,200-square-foot retail area features a hiking theme with aisles resembling a hiking trail that weaves its way through the shop. The trail is made of various tiles including some that look like local rock. A snow tunnel through the basement of the building to the parking lot makes an easy access for winter visitors. The building is located just north of the Crater Lake Lodge.